The CLASS-Agent software conducts database management of various data files from HPLC, GC, GCMS, LCMS, FTIR, UV, and AA spectrophotometers, thermal analyzers, TOC, and electronic balances as well as images and text data. Quick data searching and analyzing and approving laboratory data in the office help make laboratory work "Quick & Easy". Fingerprint verification and other powerful security measures comply with the Electronic Records and Electronic Signatures * Supplement to support "Safe & Sure management" of laboratory work. There are so many analysis files and text files in my PC that I can't find the ones I need. That's a real problem. 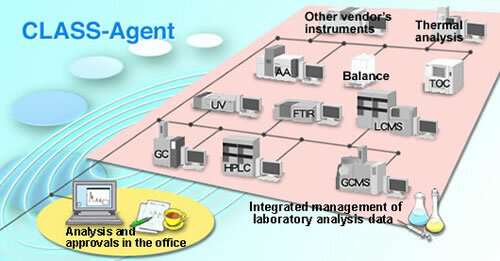 I want to analyze and approve analysis data measured in the laboratory from my own office PC. If possible, I'd like to share data between remote work sites. It's always a struggle to compile data and create reports. I use Excel® or Word® to compile multiple analysis results or results from different analytical instruments but manual input is subject to errors. It also takes a long time to compile large amounts of data. It's inconvenient to manage data in separate PCs. Data is managed in the PC connected to each analytical instrument. It is really inconvenient to compile data from multiple instruments for analysis. If the PC administrator is absent, it's sometimes impossible to browse data in a PC. It's easy to forget where I stored a file in bookshelves and cabinets bulging with documents. Sometimes the file I need has been taken by someone else, and I can't use it. I don't know how to apply security to data. I want to apply sophisticated security compliant with regulations, but I don't know how to go about it. It's easy to apply strong security. Word® and Excel® are registered trademarks of Microsoft Corporation. Supplement: What is FDA 21 CFR Part 11 Rule on Electronic Records and Signatures? This rule on electronic records and electronic signatures applies to electronic records, electronic signatures, and electronically submitted items created based on tests conducted under the GLP/GCP (clinical)/GMP rules. The Rule on Electronic Records and Signatures prescribes the requirements for converting conventional paper-based records to electronic media. Software must provide sound security to ensure data integrity that allows the data be reproduced at any time and prevents overwriting, revision, or deleting of the collected raw data. It must also provide an audit trail that clarifies who did what operation and when.